Like stuffed vine leaves, Moussaka is another ex-Ottoman Empire dish. While most of the people outside the region know the Greek version of the dish, other versions of Moussaka exists in many countries from Egypt, The Levant, Turkey and all the way to the Balkans. While I conceded stuffed vine leaves to the Turks due to etymology I can comfortably claim Moussaka to us Levantines for the exact same reasons. Moussaka is a word of Arabic origin. It comes from the Arabic musaqqa'a مسقعة which translates roughly to "Chilled" as the dish is served at room temperature. The common theme between all the different versions of Moussaka around the world is the two main ingredients aubergines and tomatoes. In Damascus Moussaka is served as a side dish or as part of mezze and strictly vegetarian. In some other parts of Syria ground meat is added and the dish is served as a main. In Lebanon chickpeas is a common extra. The Turkish and Egyptian versions call for ground meat and the Greek one you all know with the traditional layers and white sauce topping. Heat the vegetable oil to fry the Aubergine. 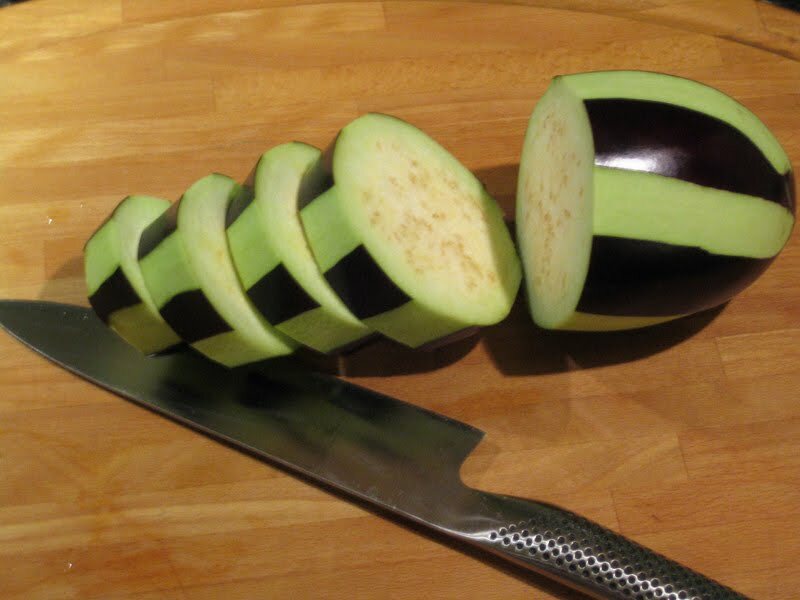 Peel the aubergine in stripes (as above, I just like the way it looks!) and cut into 1.5 cm thick slices. Fry till fully cooked and golden brown in colour. Slice the onions and the peppers, roughly chop the tomatoes and try to slice the garlic as thin as you can. In a pan, heat the olive oil and fry the onion on medium heat till soft. Add the garlic, tomato and red peppers and cook for 10 minutes or till fully cooked. Add the chopped coriander leaves and season with salt. 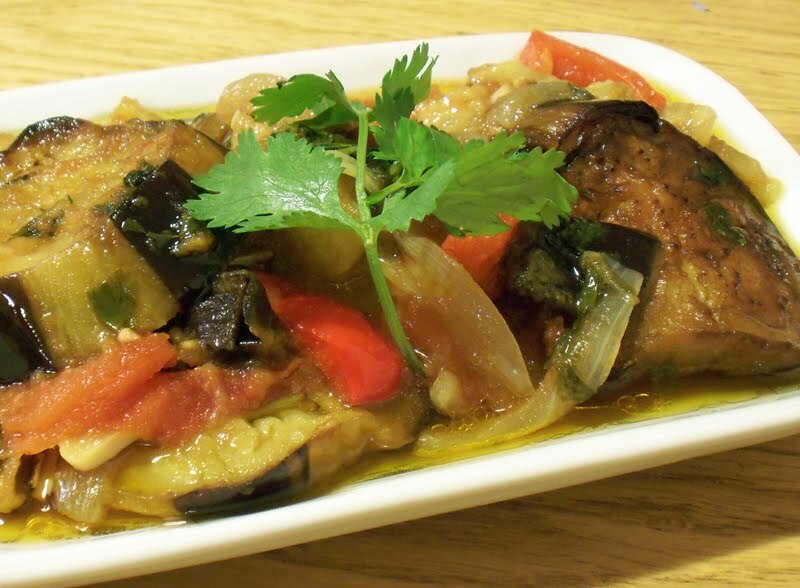 Add the fried aubergines and mix gently so you don't break the aubergine slices. Cook for further 5 minutes. Let cool down and serve with flat Arabic bread. The Syrian version sounds just as delicious as the Lebanese one! Fascinating! And I had thought that the creamy topping was the defining element! Completely wrong again! :). I like this simple recipe! I am from exYu (Balkan), and musaka (we write it phonetically) is a bit diffrent at ours...Maybe I could make one on my blog to show you what I mean. It is potatoe/minced meat/potatoe/egg+cream=baked in oven. Your version looks tasty as well! Do you use chickpeas in your moussaka? Well, the Greek Moussaka with its creamy topping is a completely different dish. It is fascinating to see how dishes develop as time pass and as the dish moves from nation to another. I would love to see your recipe. Sounds delicious. oh, this is definitely a must eggplant recipe to make. Love it! I love your blog and style of cooking. It has a nice fusion feel to it. Give this dish a try and let me know what do you think. Welcome to my blog. Is the Turkish recipe different to this one? My wife has been a fan of your blog for a while. Earlier today, I tried your recipe for Moussaka, and it was delicious. It reminded me of my mom's cooking. Thank you very much. WElcome to my blog, you and your wife. Sorry for the late reply. I am really glad you liked the recipe and it reminded you of home.